Got a lot of animations like titlebar, start panel, system buttons, taskbar buttons menus, quicklaunch buttons, start button, ........ + sounds. 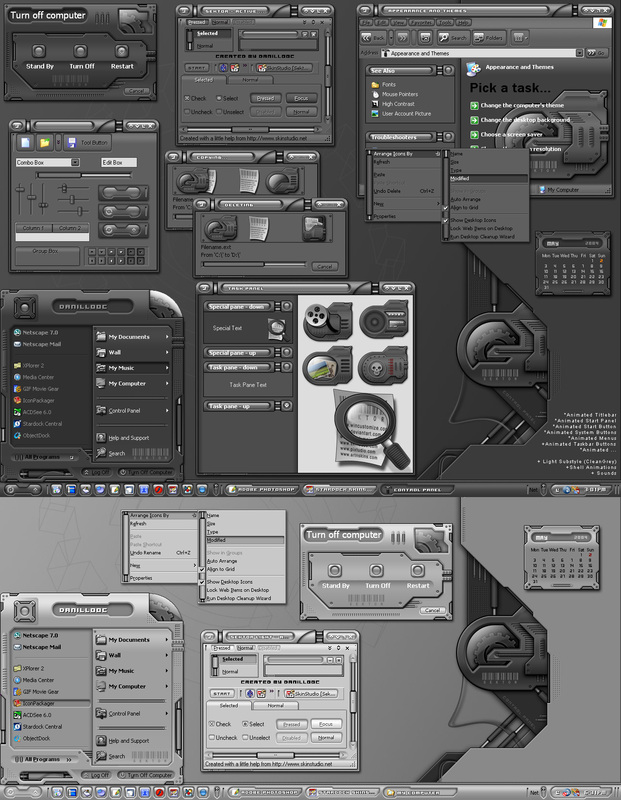 * Suggested for Windowblinds 4.29h or higher. Wow, very nice. VERY nice. Hmm... hate to say this since I talked treetog up so much, but this just might give Anteres a run. Fantabulous!! danillo, it was your 3FX that stirred the WB bug in me oh...sooo....long ago and your talent and eye for style continue to impress the heck out of me. I have loved every one of your skins that I've come across. And here you are again - Outside of these few words of praise for your work, ya leave me speechless. Great skin - and thanks for sharing it! Danillo, this is truly a remarkable skin. You keep coming up with this unbelievable designs and details. This is definitely a gold medalist. Thanks for sharing it and keep up the excellent work. I've been a long-time fan of almost every pixel you've shared for pure customization joy, and with this state of the art windowblind, you have once again managed to conquer the wb community, and shine all alone at the top! Thank you! Amazing, definitly an "over the top" competition! Animations work well, even with Pen.II Processor. Excelent work! Ooops, I forgot : The animations in Sektor are the first (and many!) I've seen in a wb that are not disturbing to use. Very original too, - but then again, all your work is! This is excellent. I love the detail and the animations give it a nice touch. But (and I may be the only one) the start panel is stretched out too far to the right and the graphics are repeated, which causes an unsightly pink line between where the start panel should stop and where it repeats. Or maybe I'm just weird. But it's very exellent all the same, don't get me wrong. Keep up the good work. Ummm, sorry. I did some finagling, and I figured out that my computer is retarded, and that there is nothing wrong with the skin, and that you are actually a genius. Sorry to have wasted your time. That's awesome. I love it and all the awesome graphics in it. I never thought these colors could ever come out with something creative again You have completely disregarded that thought. Very very excellent work here, dOC... very excellent work. The gear under the glass thing is really nice. Great job!! Hands down the best of the GUI Olympics, Well done!! !